I often get the sense when traversing the crime fiction blogosphere that I am not nearly as knowledgeable as I ought to be about my preferred genre’s heritage so I’ve been making a bit of an effort to read books written before I was born. A couple of my recent attempts have ended in grumpy DNFs about which we’ll say no more so it was nice to actually finish one of these books. 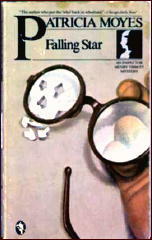 Falling Star takes place in and around the set of an independent movie being shot in London in the 1960’s. Just as things are looking a bit grim financially one of the film’s stars dies in an accident which results in a cash injection from the insurance company. When production starts again one of the technical staff dies and it is soon determined she was murdered. In steps Inspector Henry Tibbett of Scotland Yard to investigate the death. The book’s narrator, a chap called ‘Pudge’ Croombe-Peters, is a social acquaintance of Tibbett’s so is well-placed to reveal the story as well as report on the continued drama unfolding at the film set. Although the investigative protagonist is a professional detective rather than an amateur sleuth the book is similar in style and content to a contemporary ‘cosy’. The nastier details of murdering and death are left to the imagination and the plot relies heavily on red herrings, a large cast of somewhat quirky characters and a complicated sequence of events that only a supremely intelligent investigator (or reader) could keep track of. I found the book an easy, perfectly enjoyable read but I imagine the only things I will remember for any length of time are the annoying ones. The book is recounted in a style where the narrator often talks directly to the reader as if the events being described actually took place, for example “I am sure I do not have to remind you of the sensation that Robert Meakin’s death caused…”. I’ve never warmed to this style of writing and when added to the fact the narrator himself is so priggish and stupid that he warrants a good slap rather than a dose of sympathy I did find this aspect of the book a bit hard to take. However the story itself is well-plotted and the other characters enjoyable even if not drawn in any particular depth. If you haven’t read any Patricia Moyes books (I know I’m not the only one) I would recommend this for fans of a blood-free read with an intricate puzzle to solve, especially the Anglophiles as it seemed to ooze ‘typical’ British-ness from every word. This entry was posted in book review, England, Patricia Moyes. Bookmark the permalink. I often find that older novels are very wordy compared with current ones. Not wordy in the sense of overlong, but in the sense of filling in too many pieces of background minutiae. I read two “Varg Veum” books by Gunnar Staalesen – it’s a longrunning series in Norway but only a couple of the early ones were translated until very recently, when Arcadia has picked them up late-on in the series. Hence I read book 2 (written in the late 1970s) and book (approx) 14, written in the past few years. The difference in the style of language is fascinating – not that the author has “taken the foot off the pedal” as often happens with successful series, but the same info is conveyed much more leanly and economically in the later book than in the early one, in which you get lots of running commentary and opinion/analysis, and blow by blow accounts of conversations, etc.